Challenge Coin Nation was founded on a strong belief that our customers are the reason for our success. We back each and every custom product we manufacture with outstanding customer service practices, and our 100% quality guarantee. Standing behind our products 100%. Challenge Coin Nation backs each and every product we manufacture with our 100% Quality Guarantee. We will replace (at no additional charge to you) any defective custom product. We only require that you submit your written claim of defective product to us within 30 days of receipt. For purposes of this Agreement, the term "defect" or "defective" means a manufacturing error. Giving you accurate information. Prior to starting production, you will receive via e-mail a digital proof of your final custom-made product. This high-quality digital proof will allow you to spell check, verify color, size and make any additional changes or corrections prior to starting production. The "size" of your challenge coin is determined by measuring the widest or tallest point of your design. Listening to you! We want this to be the best experience you have ever had when ordering custom promotional products! If you have concerns, constructive criticism, or compliments, we’d love to hear from you. Contact us via sales@challengecoinnation.com. your account or applied to future purchases. Legal ownership of any and all logos, trademarks and copyrights. By submitting your design to Challenge Coin Nation, you warrant that you have the legal right to reproduce (or have reproduced) any logos or other images associated with your order. You also certify that the production of any images you submit does not infringe on any other person/entity’s intellectual property rights. 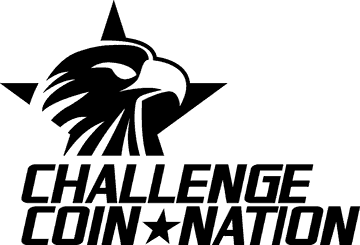 Challenge Coin Nation does not issue refunds, give credits or offer discounts. As mentioned previously, if one of the products we manufacture is found to be defective, we will gladly replace it (at no additional charge to you). We only require that you submit your written claim of defective product to us within 30 days of receipt. Binding Agreement. This agreement is the entire agreement between Challenge Coin Nation and our customers and supersedes any other communications via email or telephone with respect to this promotional products order. In the event that a legal dispute arises, it is agreed that the exclusive jurisdiction and venue for such a dispute is Orange County, Florida, USA., and that the prevailing party is entitled to an award of reasonable attorney’s fees before trial or hearing, during trial or hearing, after trial or hearing, and/or appeal. Should Challenge Coin Nation be named in a copyright/trademark infringement lawsuit arising out of Challenge Coin Nation use of a copyright/trademark protected item provided by you for use in your product, you agree to indemnify Challenge Coin Nation for any damages and/or litigation-related expenses borne by Challenge Coin Nation. All of the products displayed on this web site containing corporate logos or registered trademarks are shown only to illustrate the reproduction capabilities of Challenge Coin Nation. Purchase of merchandise from Challenge Coin Nation in no way, shape or form grants you permission to reproduce logos, nor does it transfer, grant or lease ownership of any logos or trademarks to you.